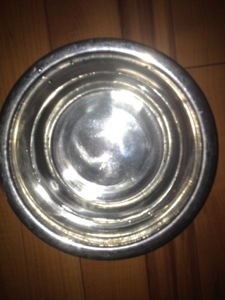 T. – Age 14 months keeps stealing the dog’s water dish – while it is full. dumping the water all over the floor. You’d be surprised, actually, how much water is really in a little dish like that. You’d also be surprised, I imagine, that we keep forgetting to put the water bowl back up under these circumstances – but, we do. Last night we were in the front room when we heard a clang and the subsequent “whoosh” from the kitchen. We immediately knew what had happened. My husband and I exchanged looks (translation: “I’m not cleaning it again you do it”) while my little son toddled into the room, dog dish clasped in his chubby hands in front of him, grinning from ear to ear, delighted at his prize and showing off his mad ninja water-bowl acquiring skills to his tired parents. The poor pug just looked at us all, shaking his head sadly. I would have much preferred to show a picture of my son WITH the bowl, but he wasn’t cooperating.